extract(Field d, Type t) - returns a Field in which the MathType t has been extracted. resample(Field d, domain) - returns a new field, resampled from 'd' into the new 'domain'. The domain type must be identical to the original. combine(Field  d) - returns a single new Field with the same domain as all the original 'd' fields, and a range that is the combined range of all the 'd' fields. getValues(Field d) - returns a double of the 'flat' components of Field 'd' in their default units. The first dimension of the returned array is the number of range compnenents. makeDomain(min, max, int npts) - returns a 1-D domain of from min to max. 'min' and 'max' may be either ints or floats or doubles. makeDomain(min1, max1, len1, min2, max2, len2) - same as above except for 2-D topology. makeDomain(min1, max1, len1, min2, max2, len2, min3, max3, len3) - same as above except for 3-D topology. 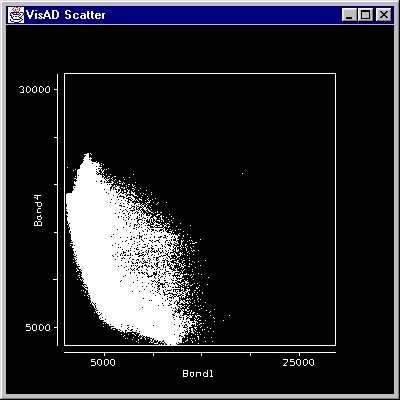 Suppose you have a multi-channel image and just want to draw a quick scatter plot of the brightness values in channel 0 versus channel 2.